Golden bursts of light brighten up the sky. 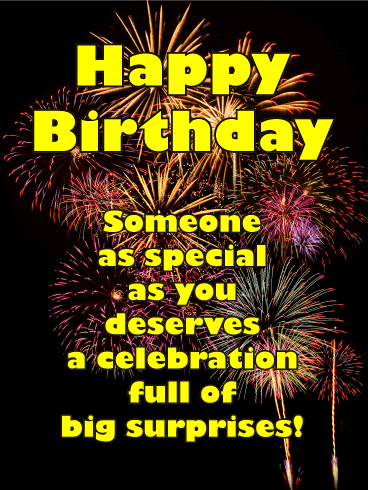 It’s the biggest and best way to celebrate someone on their birthday! Remind them that this year, it’s their time to shine and to enjoy every fun-filled moment. 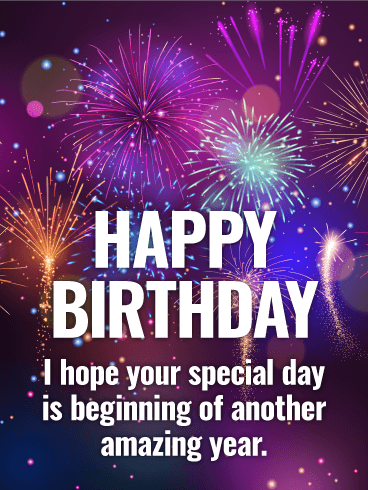 You can be sure when you send this awesome greeting, they’ll be feeling the love, not just on their special day but every day that follows. Move over balloons and birthday cake! Fireworks are here to make a bang for this year's birthday celebration! 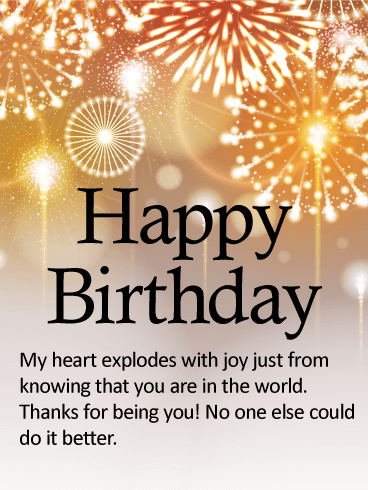 This birthday card is a combination of fun and simple that's sure to bring a smile to anyone's face. After all, who doesn't love feeling like their special day warrants some fireworks and a huge celebration?! We know we would! 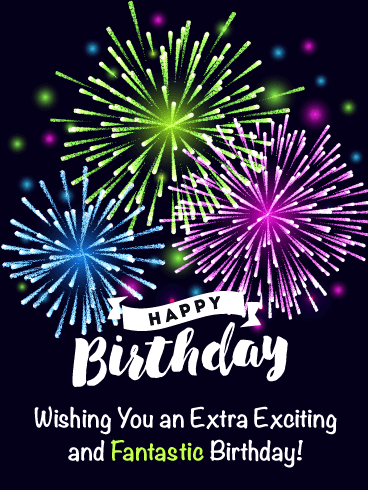 Someone as special as they deserve to celebrate their birthday in the most exciting way. 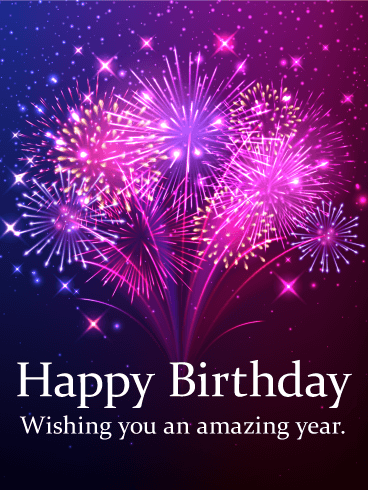 That’s what makes this card the perfect one to send! Bright fireworks in the background set the scene for an amazing day, and your words promise it will be full of big surprises, which sets the tone for a wonderful year ahead. Fireworks light up the sky, in pink, orange and yellow. 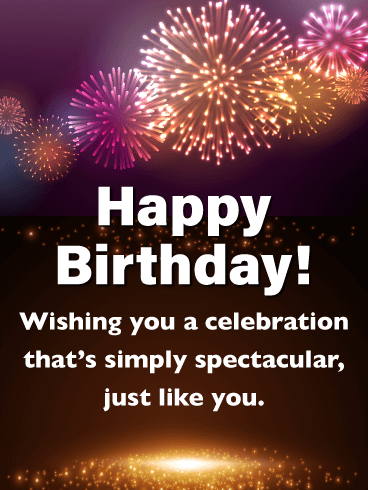 That’s the kind of spectacular birthday celebration they deserve, and this is just the card to let them know! 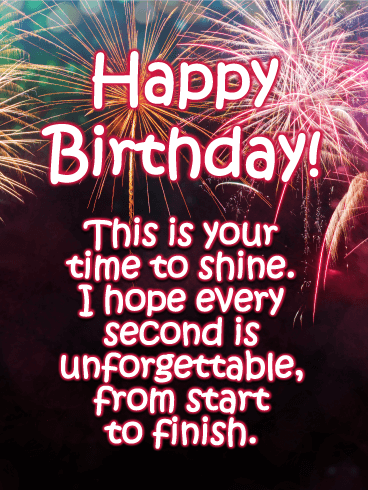 Whatever age they’re turning, and whoever it may be, make them know you remembered with a greeting that reminds them just how great they are and how much they mean to you. Everyone knows that a special occasion is taking place when they see fireworks, and that’s what makes this card so great. It displays blue and purple fireworks shooting into the night’s sky. It looks spectacular! Fireworks are a true representation of excitement and fun, two things anyone celebrating their birthday should experience! 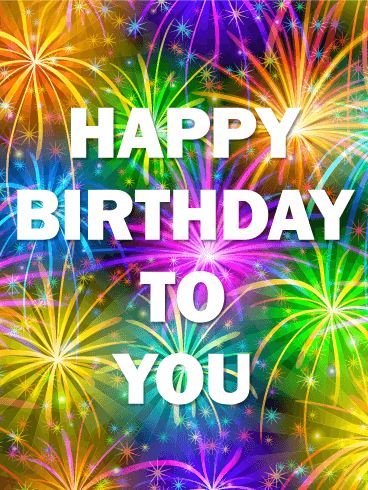 Want to make sure their birthday is a blast? 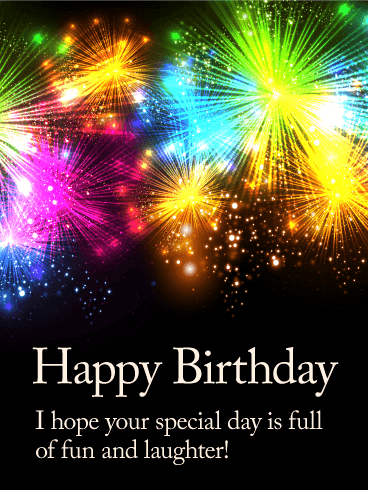 Send this awesome card! With colorful fireworks bursting in the background, it’s a great way to wish them a celebration that’s unforgettable from start to finish and to remind them that it’s their time to shine, not just today but in the year ahead. 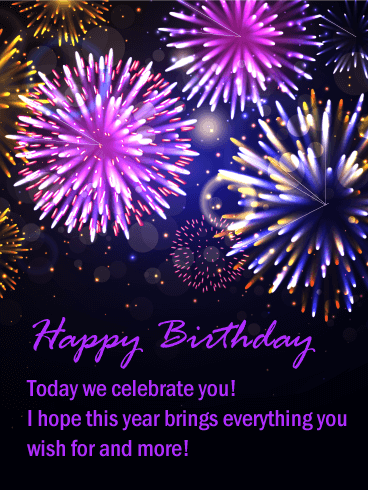 Happy Birthday - Today we celebrate you! I hope this year brings everything you wish for more! 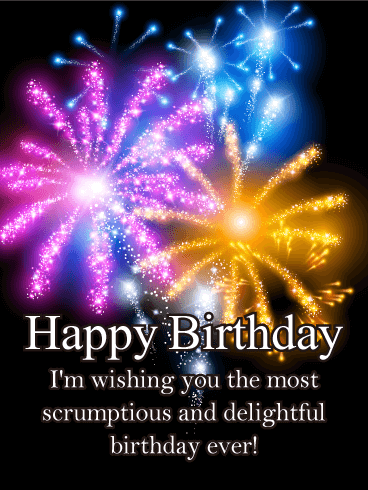 Happy Birthday - I'm wishing you the most scrumptious and delightful birthday ever! 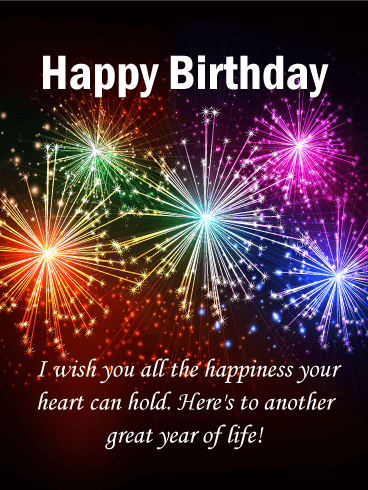 Happy Birthday - I wish all the happiness your heart can hold. 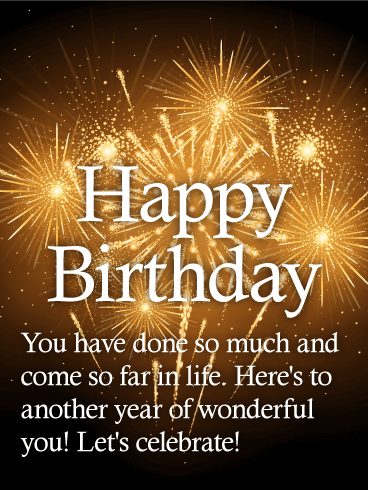 Here's to another great year of life! Tasteful, classic, and fun. Those adjectives apply to both fireworks AND your friend! 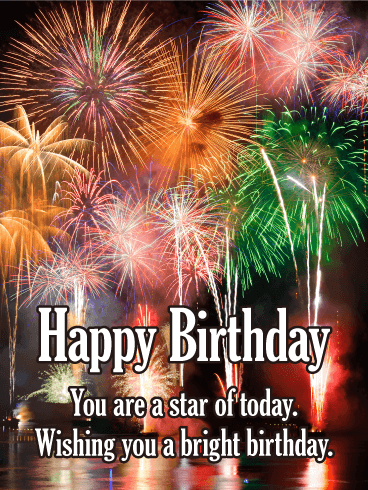 This cool birthday card featuring a breathtaking fireworks show is suitable for birthday guys or gals of any age/part of life! 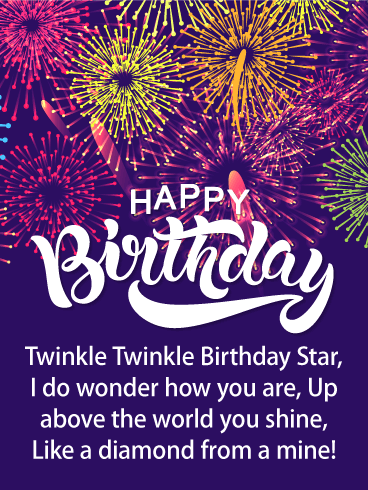 Burst love and light into someone's special day by sending them this happy birthday card wishing them a spectacular celebration! The bright pops of color over the black background are sure to put anyone in a party mood! Some people have such bright, sparkly personalities; much like a firecracker! 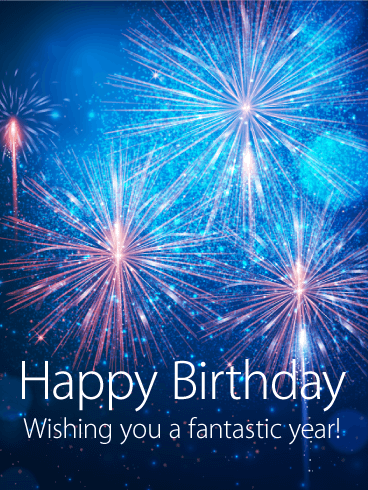 Now it's your turn to light up their lives by sending them this epic firework display Happy Birthday card! 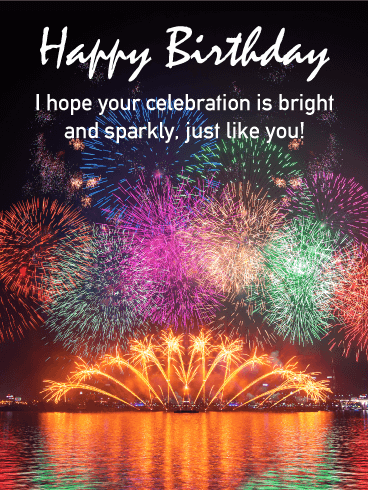 Huge, brilliantly-colored fireworks light up the night over a large body of water on this card, all underneath the thoughtful message that you hope the receiver has a day as great as they are! 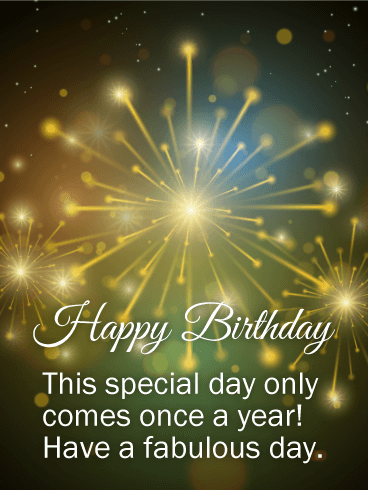 Do you want to make someone's birthday even more wonderful? Yes, of course you do! 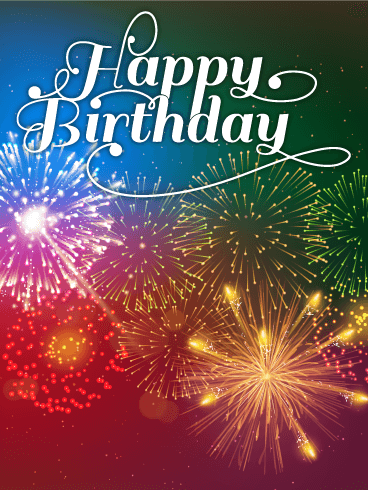 Burst your way into their heart while wishing them an absolutely wonderful day by sending them this incredibly, colorful fireworks display Happy Birthday card! 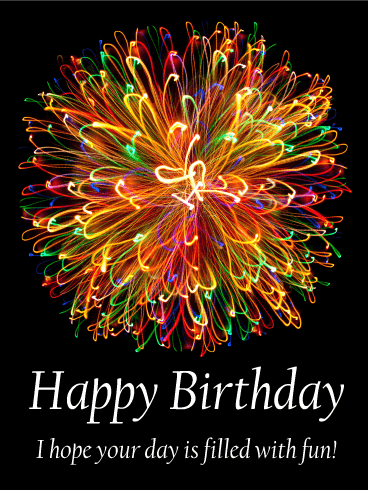 Bright sparks of blue, green, purple, orange, and yellow light up this birthday card, making it a feast for the beholder's eyes! When you see fireworks it's near impossible not to think of celebrating, right? 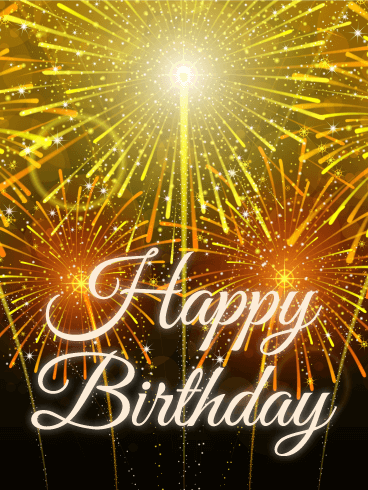 Set the mood for someone's fabulous day by sending them this golden fireworks display happy birthday card! 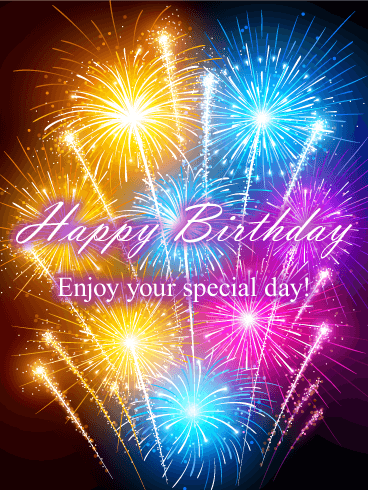 A person's birthday only comes around once a year after all, so don't let the event pass by unnoticed! 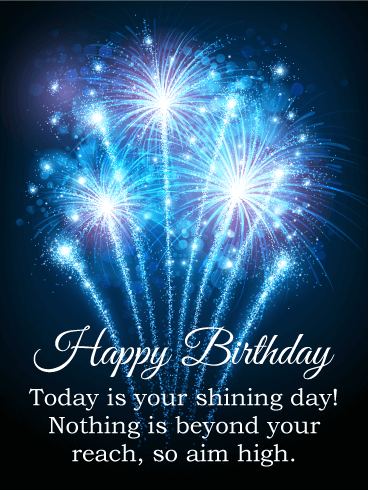 Shout it from the rooftops, send up a spark, happy birthday! Flash! Bang! Boom! 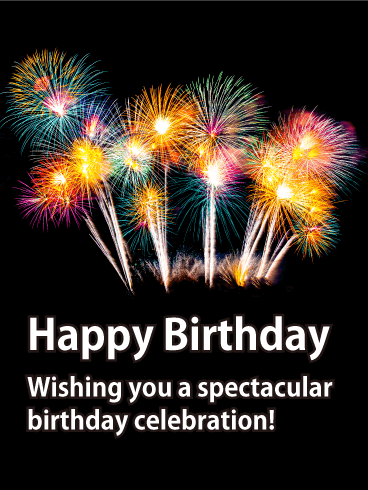 Send this mighty fireworks display happy birthday card for a birthday greeting that packs a punch! Perfect for someone with a bright, shiny personality that can't be kept down! The little rhyme on the card inquires how they are doing while complimenting the way they brighten the lives of those around them! This card is sure to make anyone feel warm and fuzzy inside when they receive it on their big day! 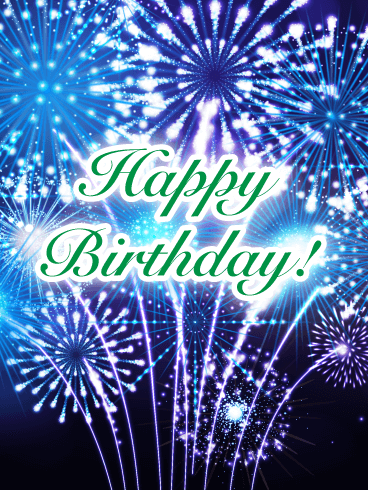 Is today a birthday or a firework celebration?! 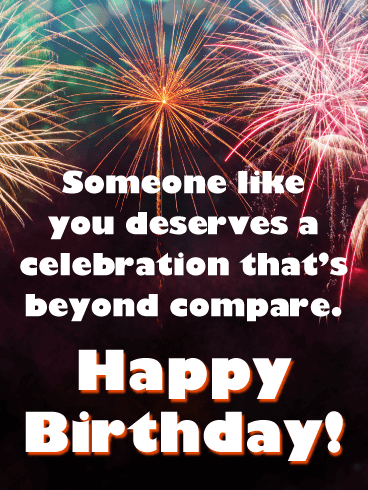 With this awesome birthday card, it can be both! 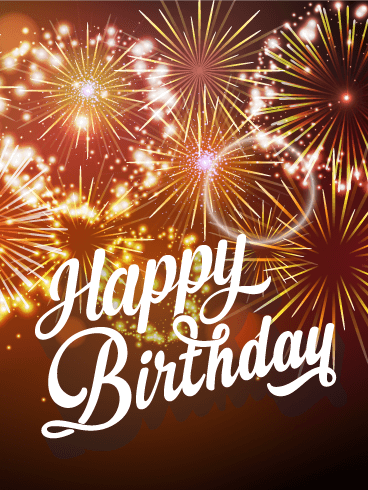 If you can't make it to a firework show to celebrate your loved one's birthday, this birthday card is the next best thing! On top of the gorgeous colors and bright display, calling the recipient a star is sure to make them smile. This is a can't-miss pick! Fourth of July isn't the only time to break out the fireworks, and neither is New Year's Eve! 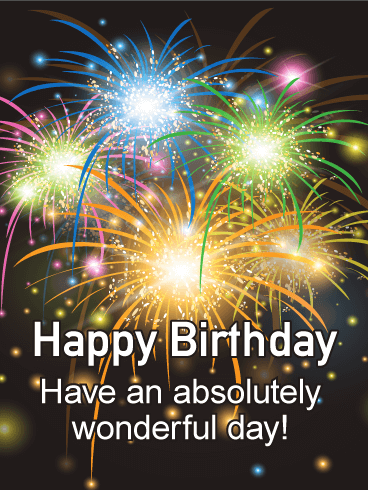 It's someone special's birthday, and this exciting card is an awesome way to celebrate. 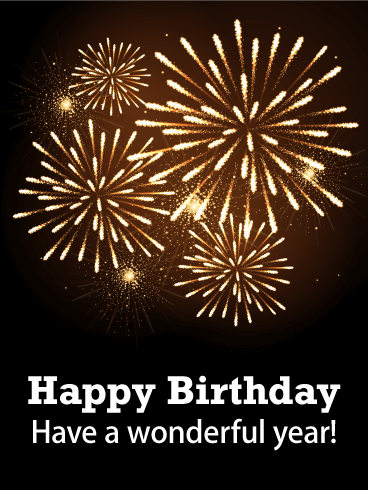 The fireworks show that the recipient's birthday is important to you while making this card fun and exciting. This is a great choice for anyone celebrating a birthday. Break out the fireworks... it's time to celebrate! 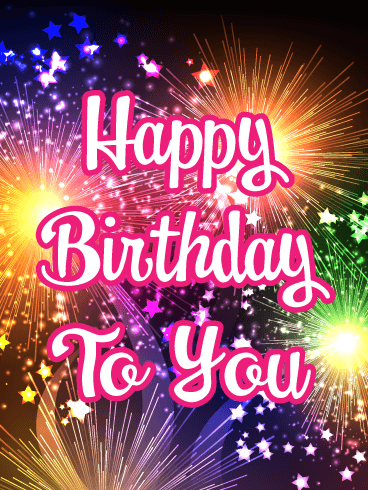 Whether you've been searching for the perfect card for a sibling or trying to find a way to wish a neighbor a happy birthday, this birthday card is a great choice for anyone. The bright colors make it fun and exciting choice, while the cursive font adds just a touch of sophistication. Light up the night! 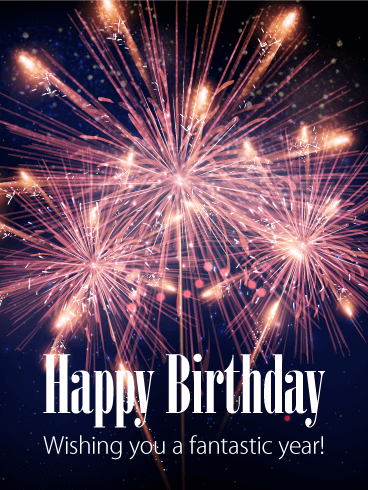 A thrilling fireworks display is the ultimate way to wish a happy birthday to someone you know! 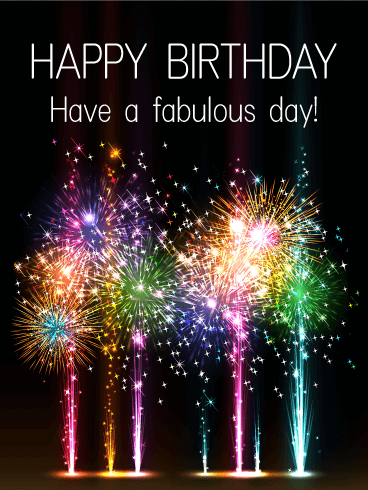 Make it a fabulous birthday by sending a fabulous birthday card! It's as simple as that. 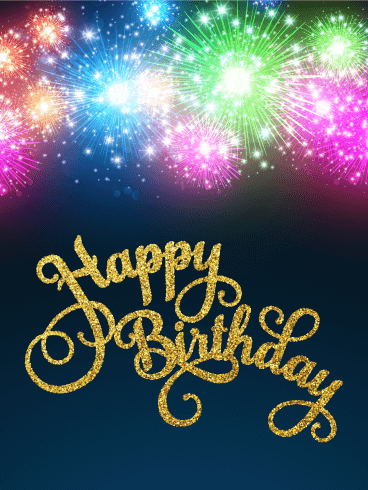 Fun, easy and fast-send a stylish birthday greeting card in a snap. 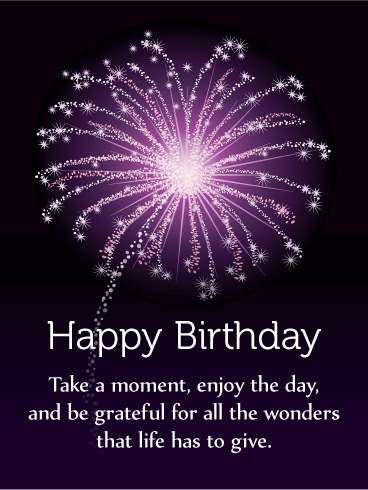 Birthdays are meant to be awe-inspiring and exciting-just like this fabulous birthday greeting card! 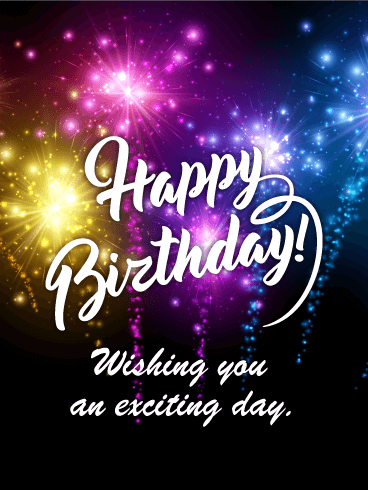 Bright shining colors fill this birthday card with thoughts of fun days filled with happiness, laughter, and excitement, a perfect happy birthday message that can get anyone excited about their special day! The fun neon lights against the dark black background make the colors pop, which can only mean that it's time to start celebrating! 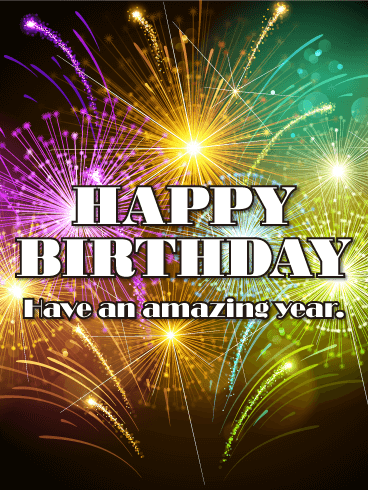 A birthday isn't just the day someone was born, it is also the beginning of a new year, a chance to do amazing things! Now that is something worth celebrating! The bright sparkling fireworks bursting in the purple sky are an exciting reminder that the sky is the limit for what can be done in the new year ahead. 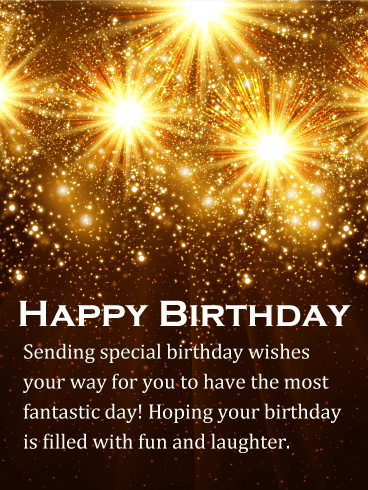 Sending this birthday card out to someone on their special day is a birthday gift in itself! 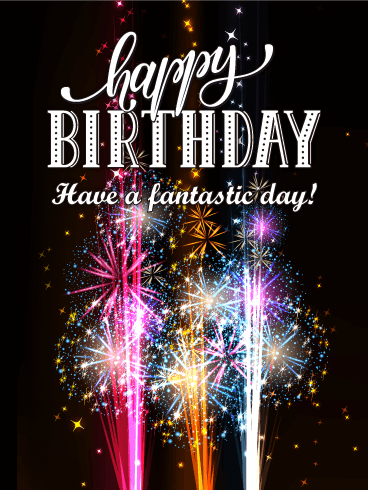 This birthday card has celebration written all over it! The colorful fireworks bursting in the sky look so vibrant that you instantly have a feeling of excitement and joy. 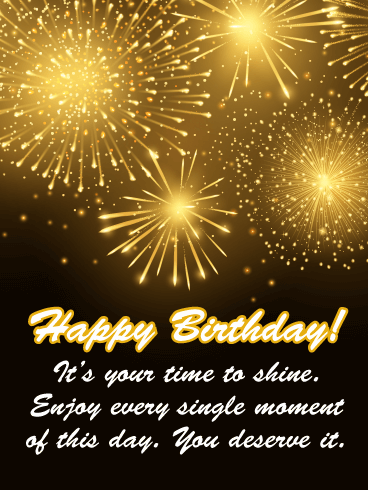 Happy Birthday is displayed in gold shimmering letters, an extra touch that is bound to brighten any birthday. 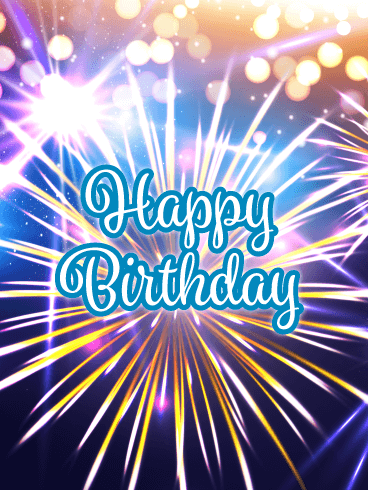 If you need a card that will add an exciting element to someone's birthday, then this glowing fireworks card is the perfect solution!